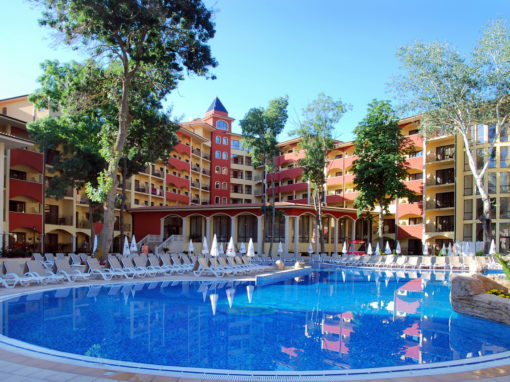 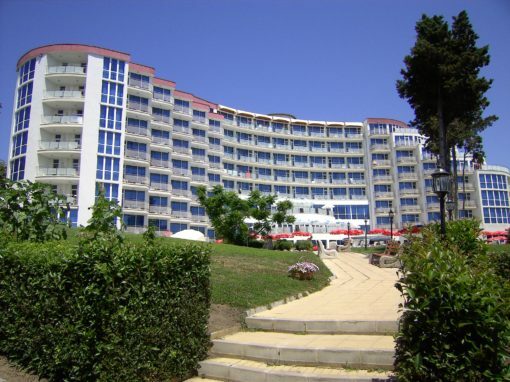 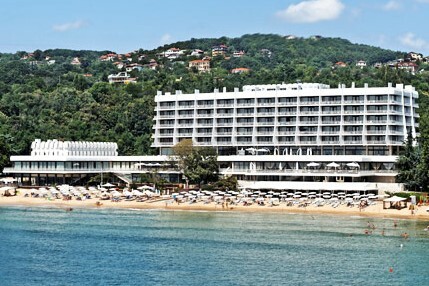 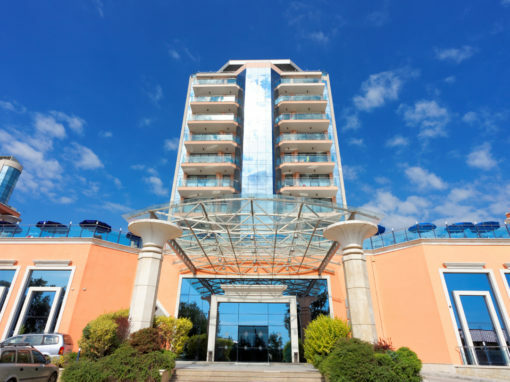 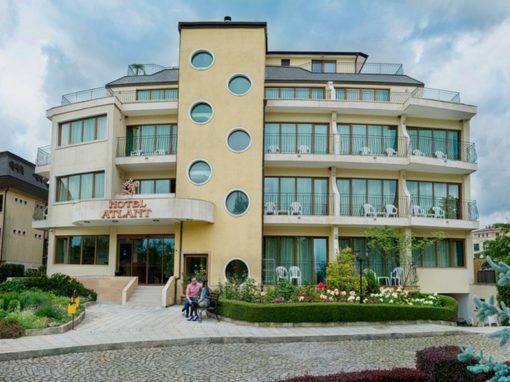 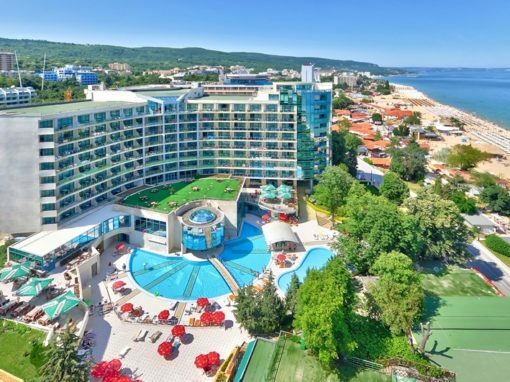 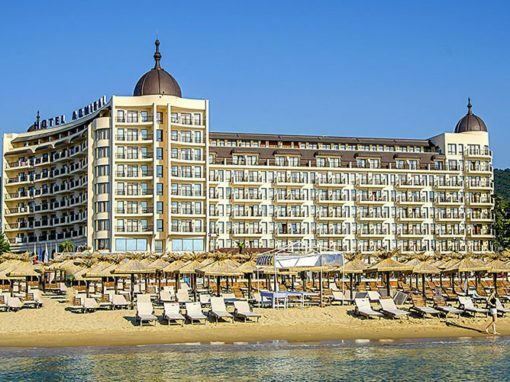 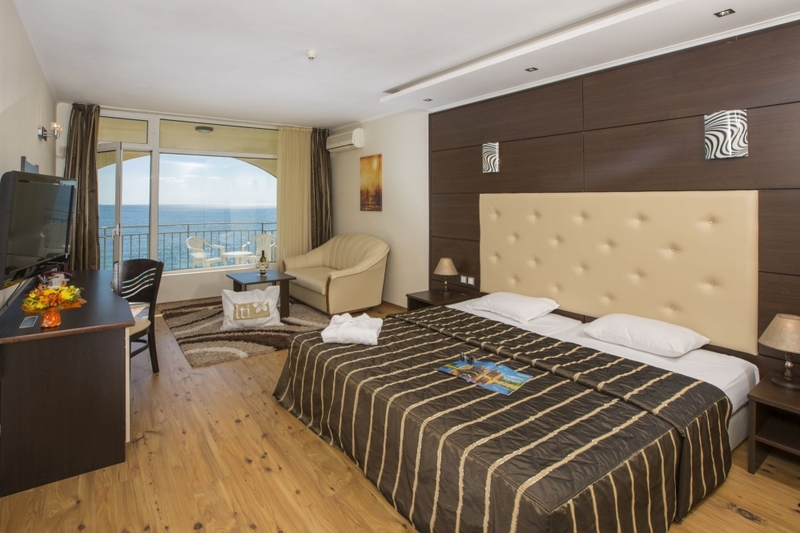 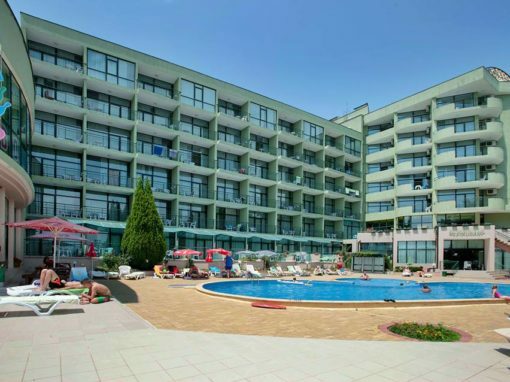 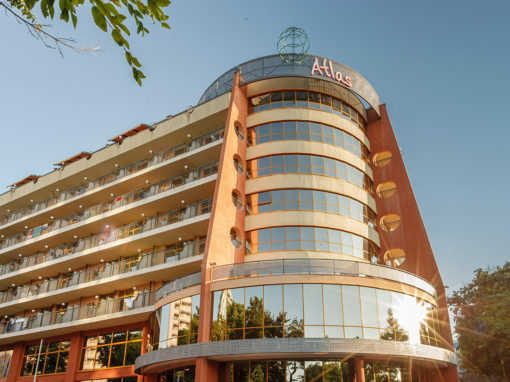 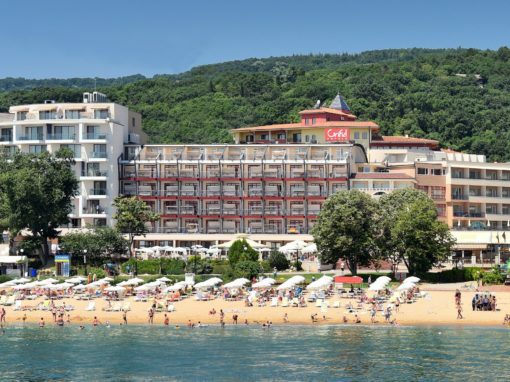 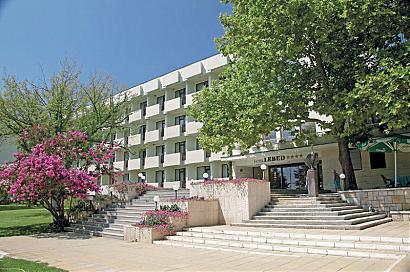 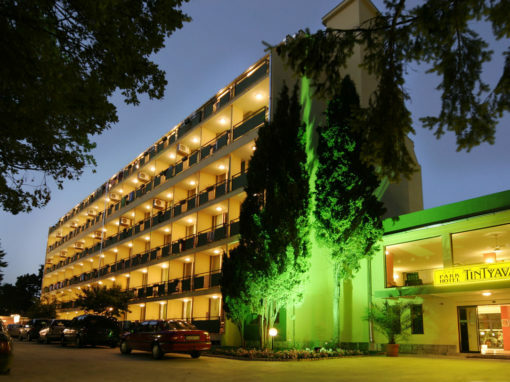 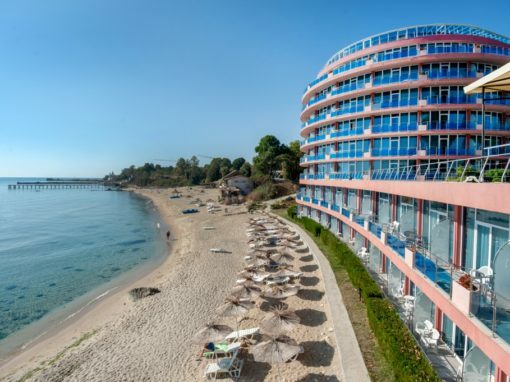 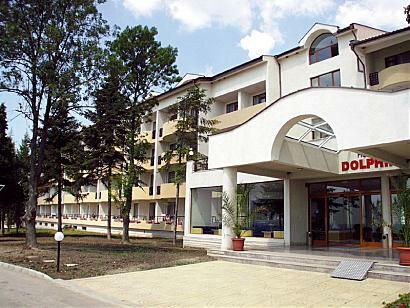 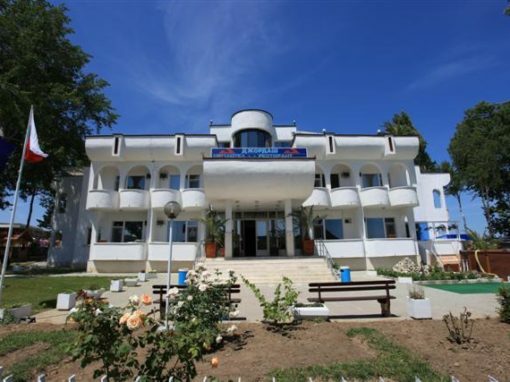 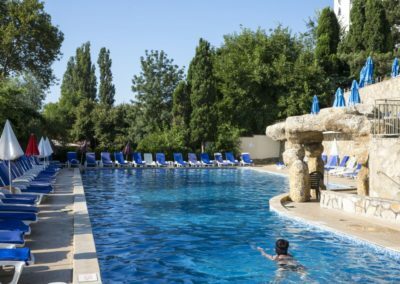 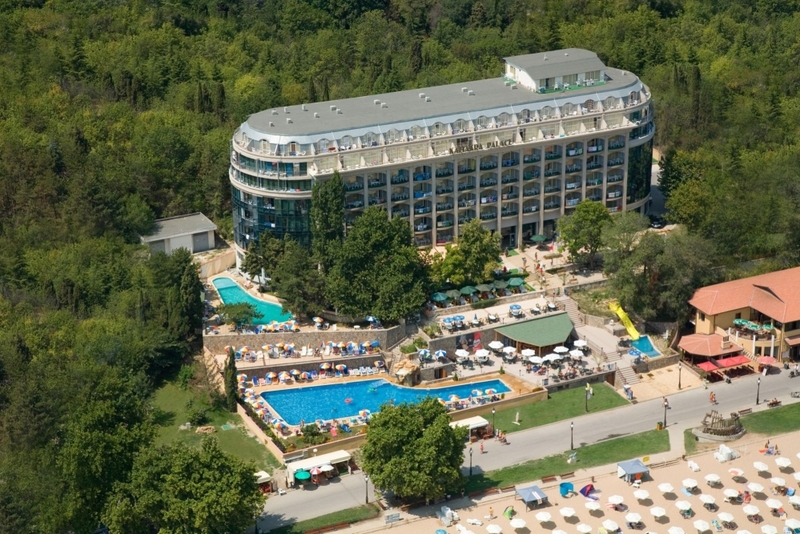 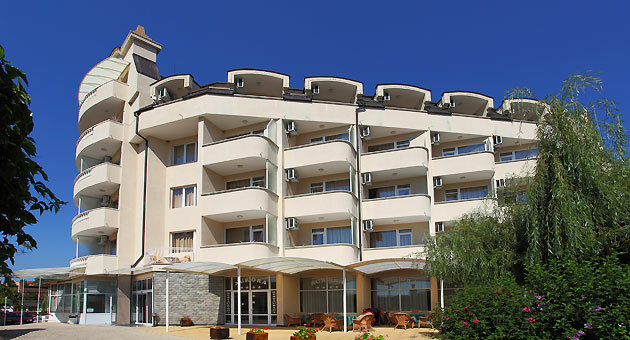 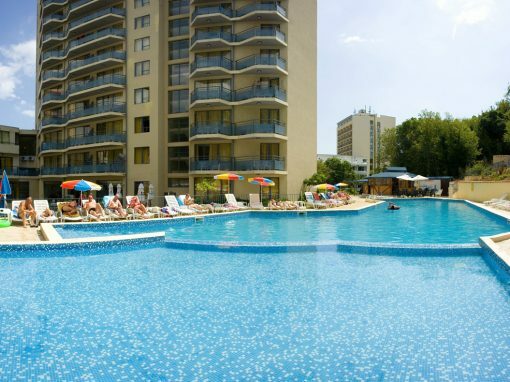 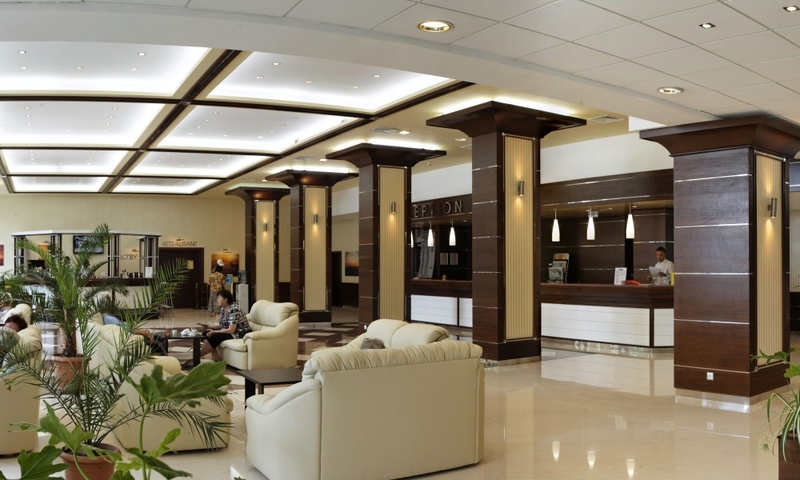 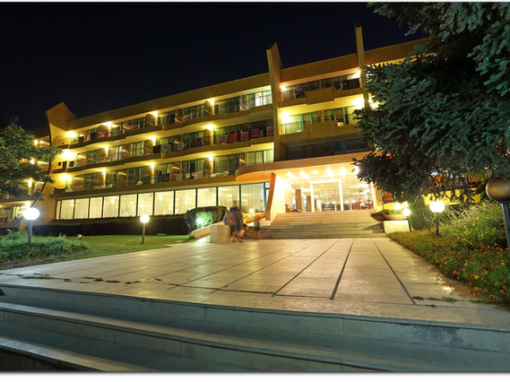 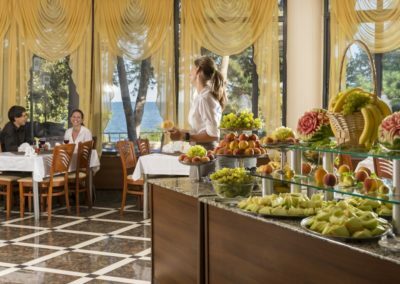 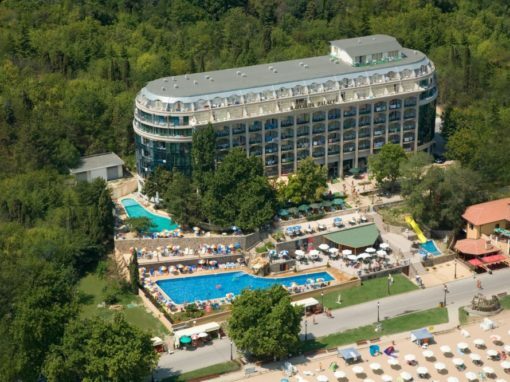 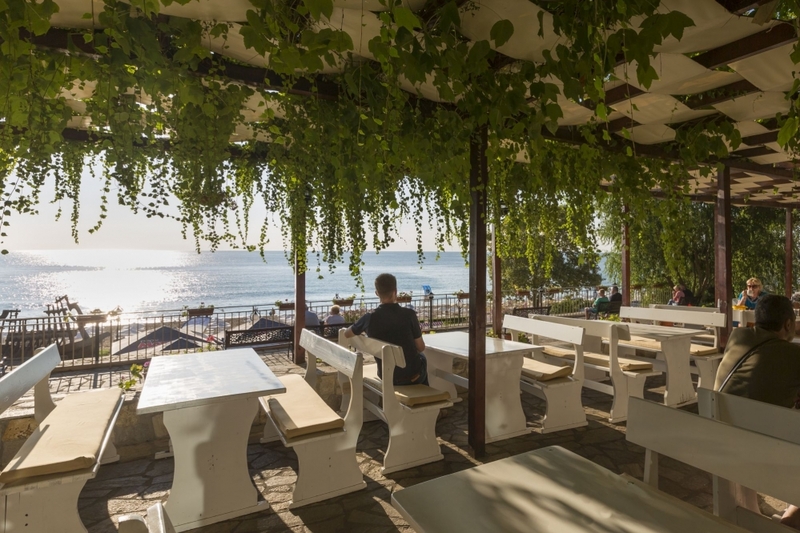 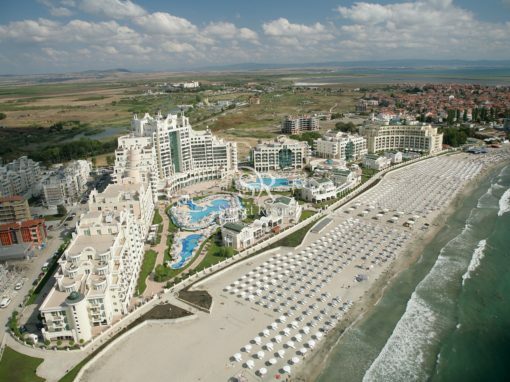 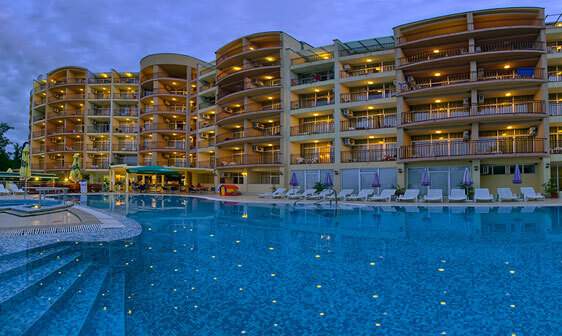 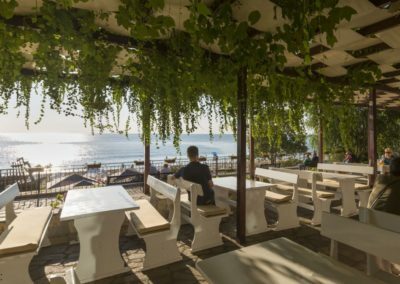 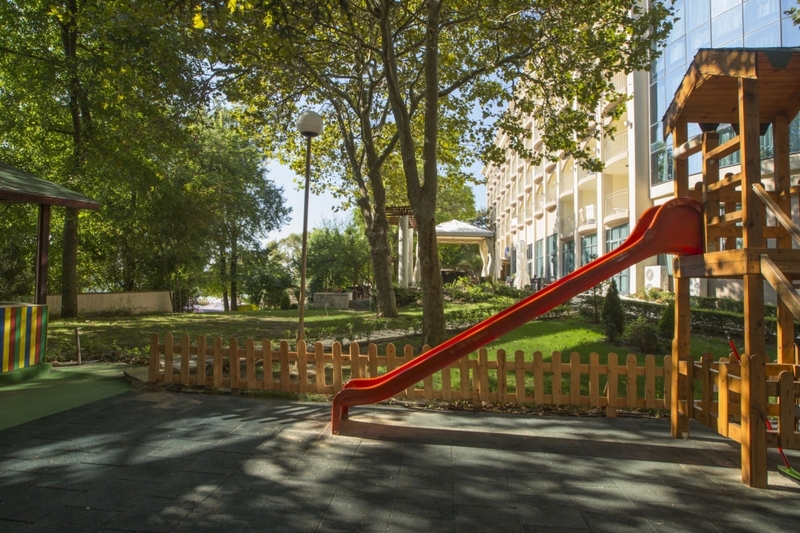 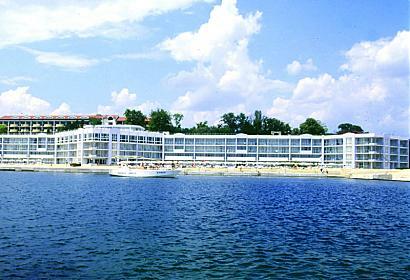 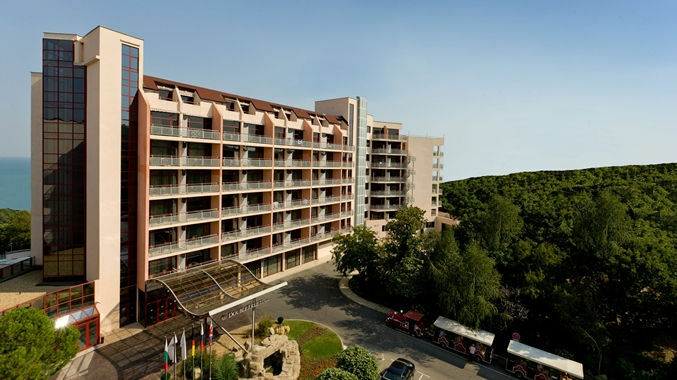 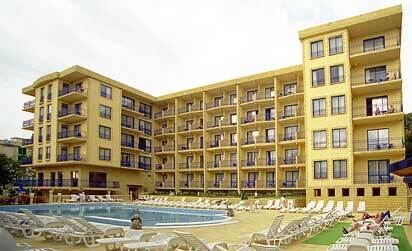 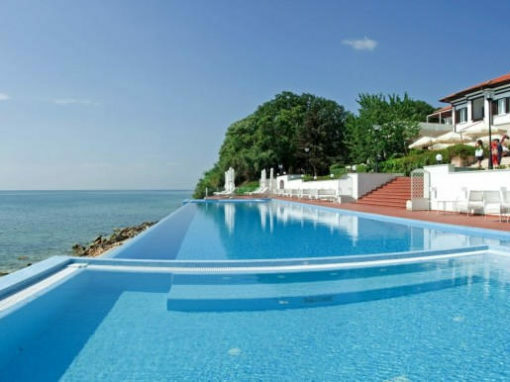 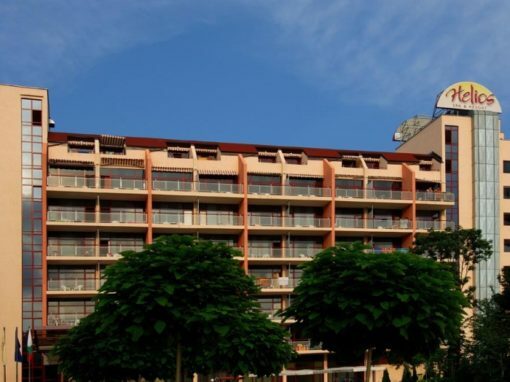 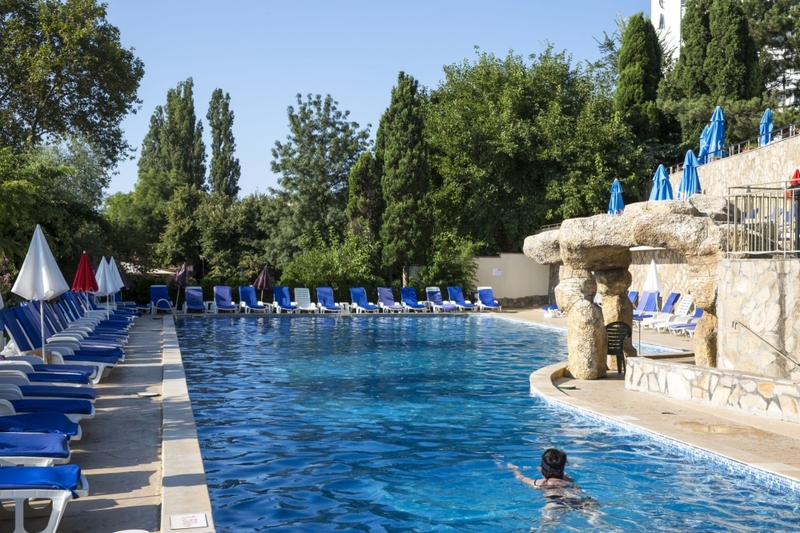 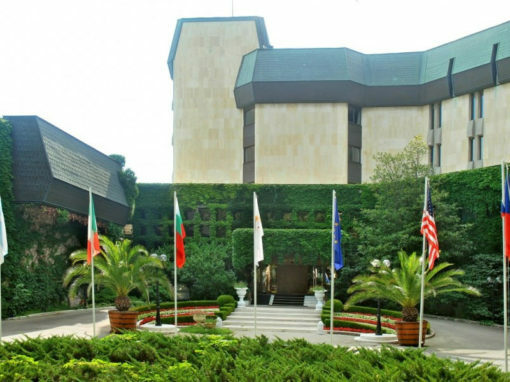 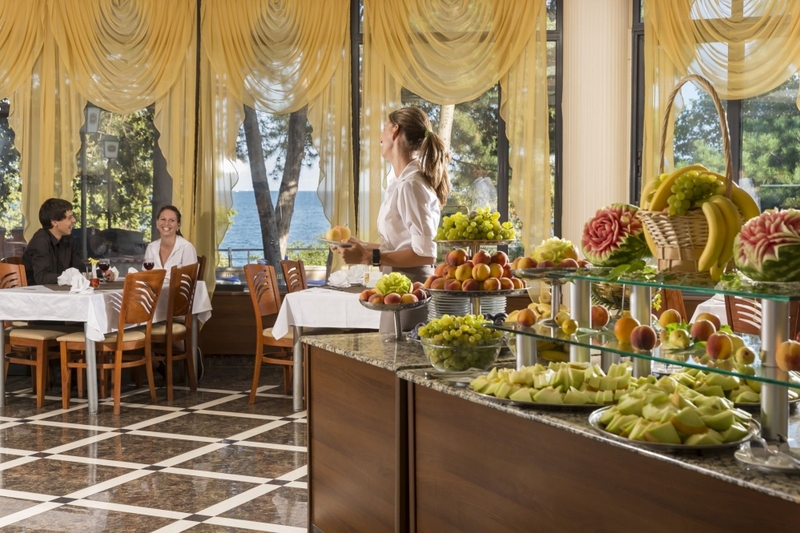 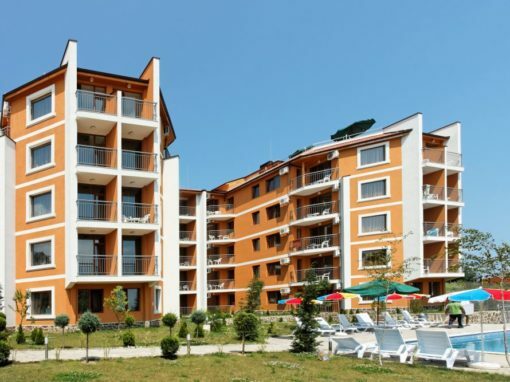 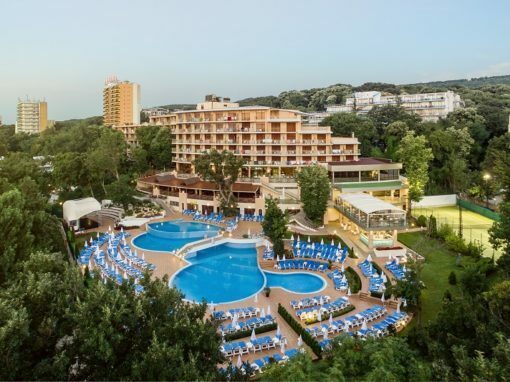 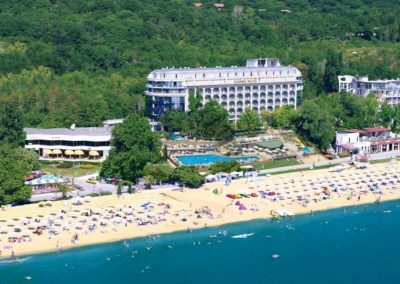 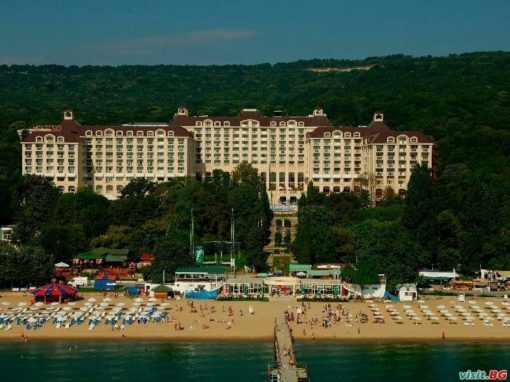 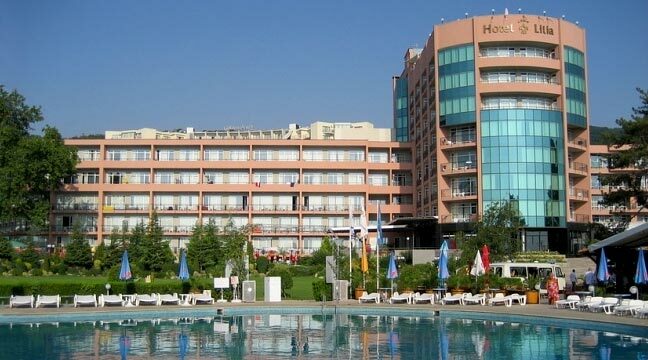 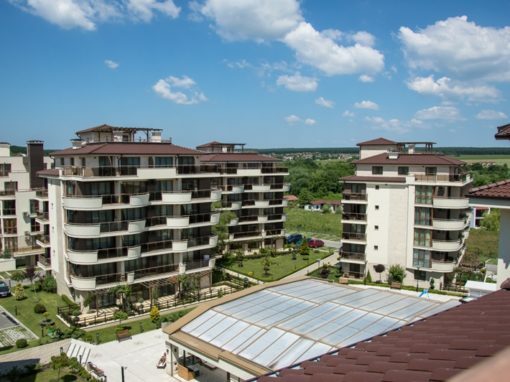 Kaliakra Palace is situated on the main promenade of the resort. 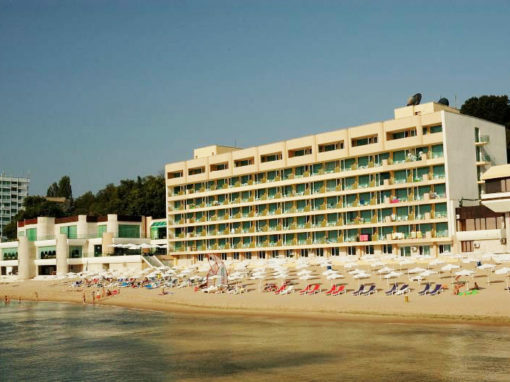 The glorious sandy beach is some 20m away and is reachable by a series of steps. 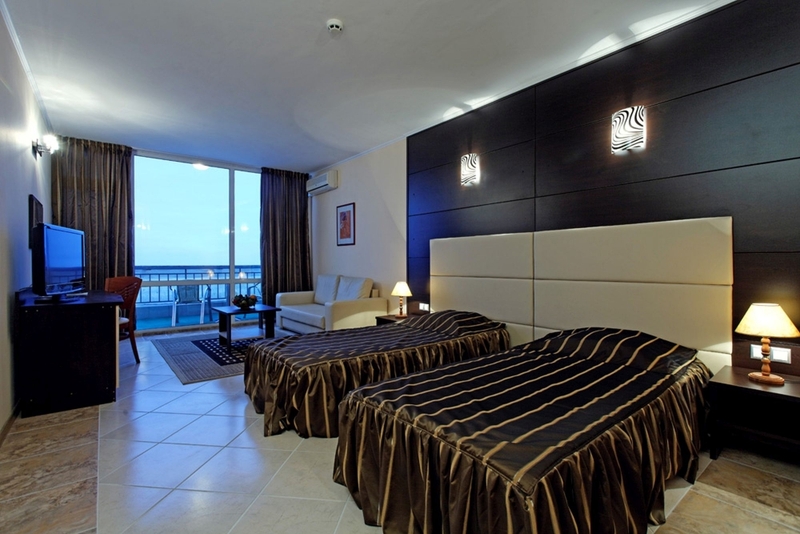 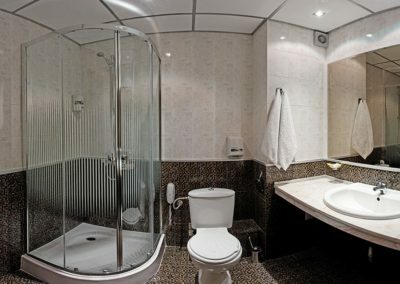 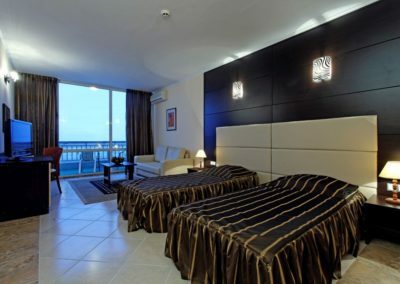 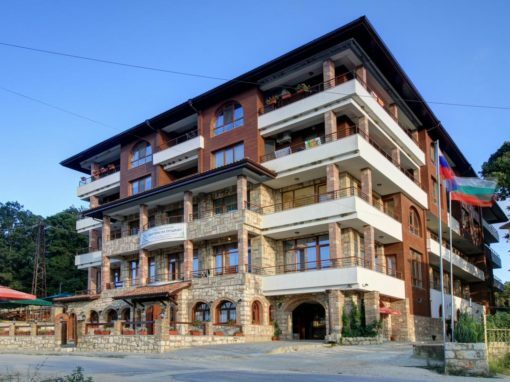 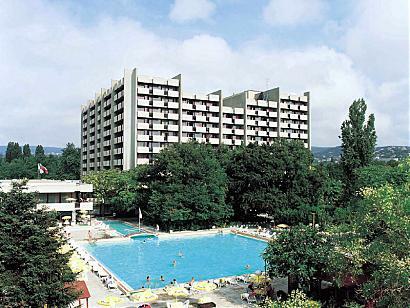 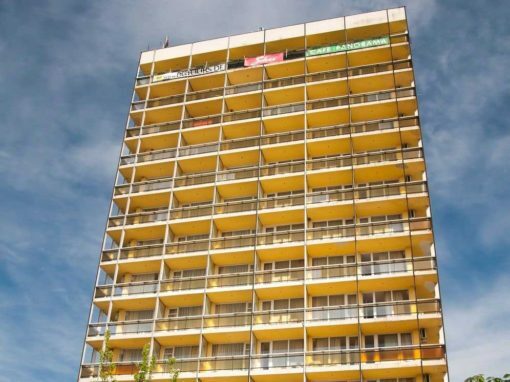 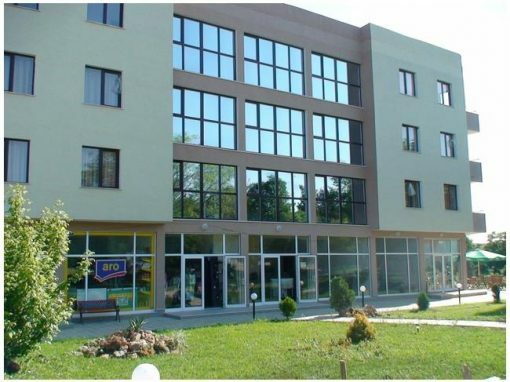 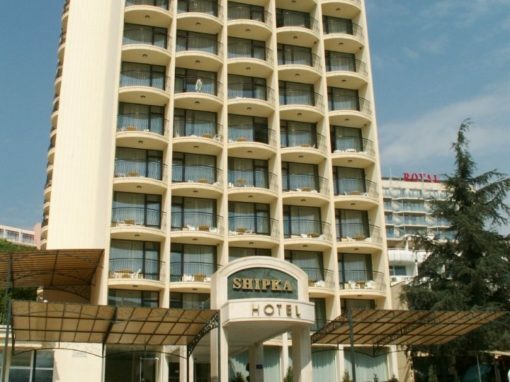 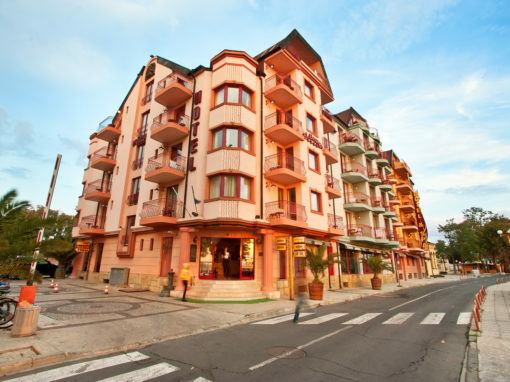 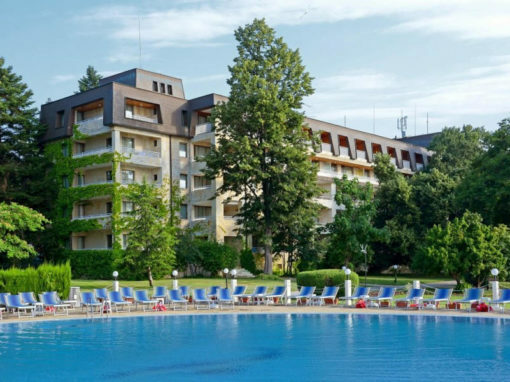 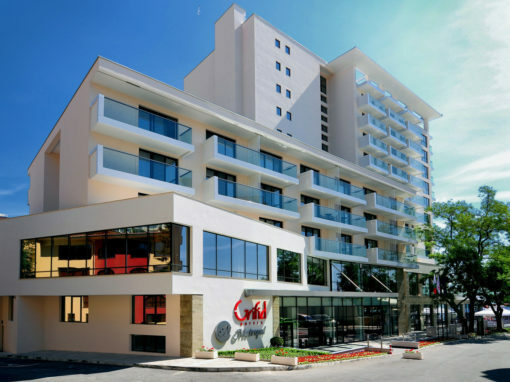 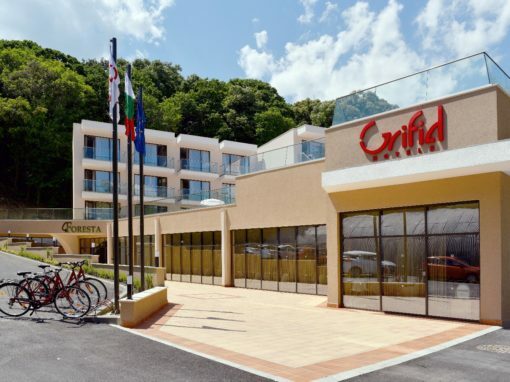 The hotel offers 200 rooms- double, single, studios and apartments,7 floors and 2 lifts. 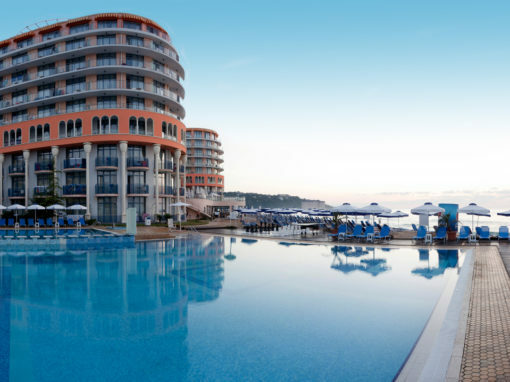 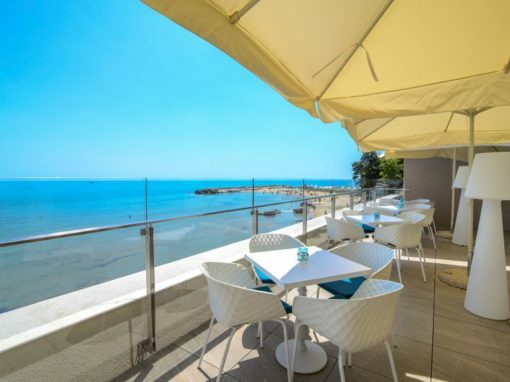 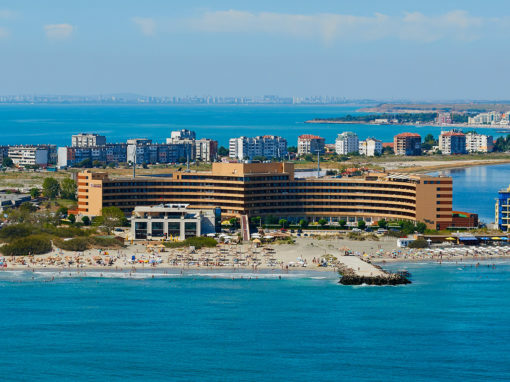 There are plenty of facilities, including : ∙ Restaurant with open-air terraces overlooking the beach∙ A-la-carte Fish Restaurant · Restaurant BBQ terrace · Lobby bar ∙ Cocktail bar /drinks against payment/ ∙ 2 Pool bars ∙ 1 Indoor swimming pool ∙ 3 Outdoor swimming pools /including separate children’s swimming pool with kids water slide/ the largest of which being situated some 10 m away from the sandy beach ∙ sun beds and parasols at the swimming pools are free of charge∙ Multifunctional sport playground ∙ Children’s play area and kids club· Massage ∙ Sauna ∙ Fitness corner ∙ Doctor ∙ Billiard ∙ Shop ∙ Internet corner · WI FI at the lobby area and superior rooms. 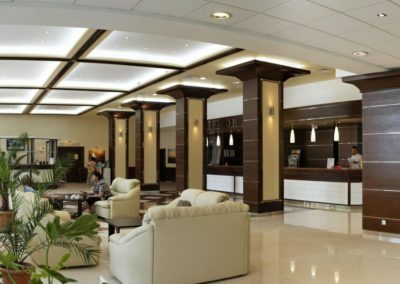 Exchange desk · Animation Hall · ATM Machine · Conference Hall with equipment /upon request/ for up to 150 people. 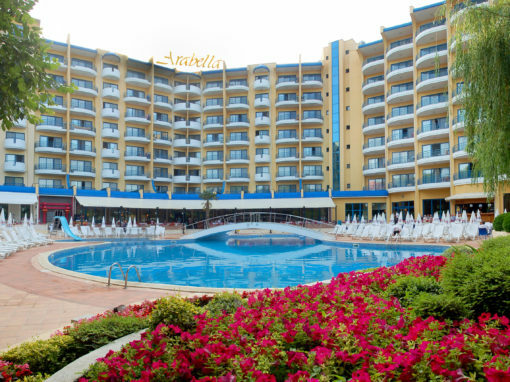 Sport, entertainment and extra services, included in the Ultra all inclusive. 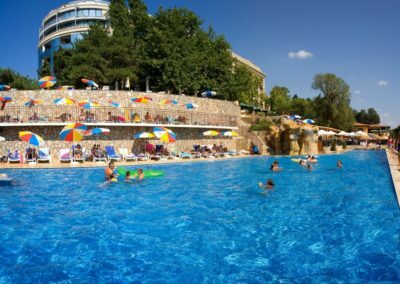 Table tennis, fitness, chess, darts, water volleyball at the pool, mini- football, volleyball and basketball at the playground, aerobics, water gymnastics, daytime sports’ animation and games. 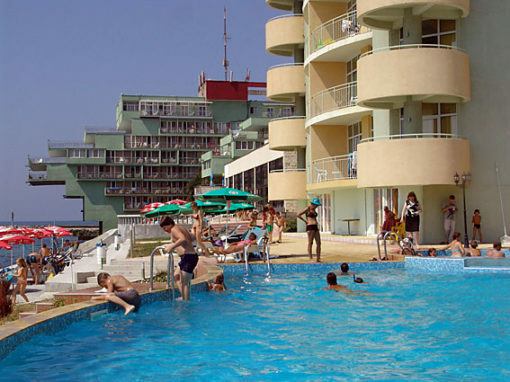 There is an evening show, 6 days a week. 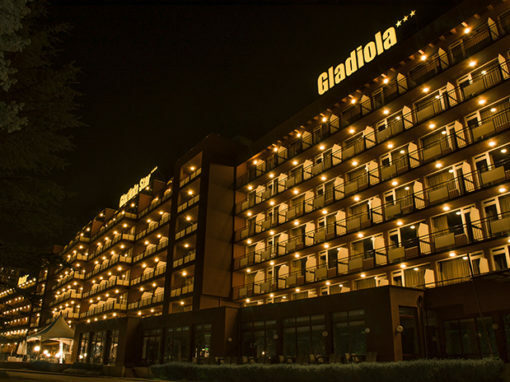 The show starts at 21:00. 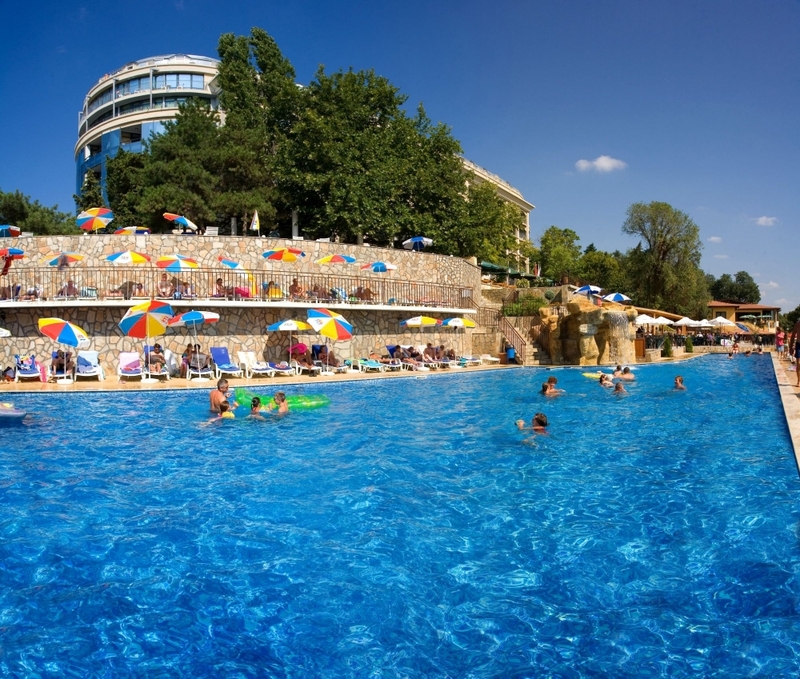 Sun beds and parasols at all swimming pools and оn the beach are free of charge. 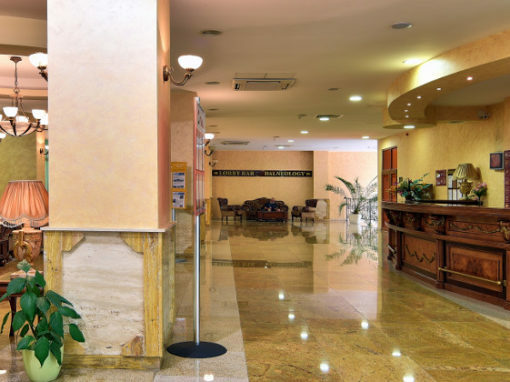 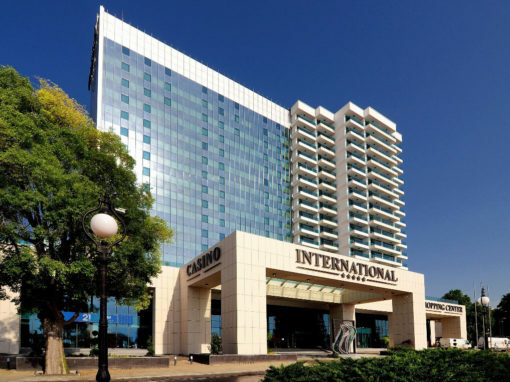 Wi- Fi access in the lobby and superior rooms.